The story of Max is coming to an end as Flowy, the symbol of creative interaction with AI, is penetrating not only Max’s reality but also her creators’. 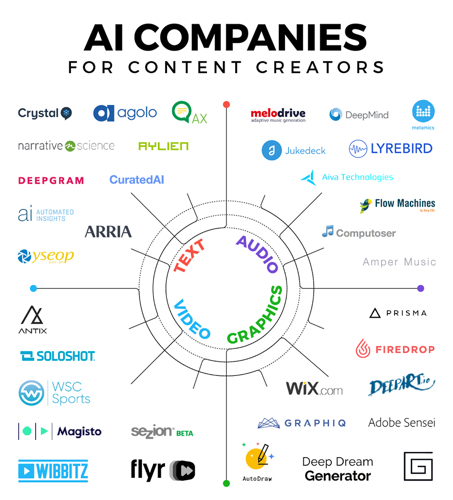 Indeed, AI content creation is becoming more and more common, and even Wibbitz has shared an infographic mapping out its landscape. Look into it, you’ll find Flowy! The title Magic Man has been composed by Flow Machines exploiting the style de Michel Berger, a French singer and songwriter. The soundtrack of this episode comes from the AI composed song "Mister Shadow".“Mr Shadow is composed in the style of American songwriters such as Irving Berlin, Duke Ellington, George Gershwin and Cole Porter. French composer Benoît Carré arranged and produced the songs, and wrote the lyrics. It seems that Max has acquired the capacity to create as a sleepwalker artist but she has lost her assistant Flowy; even worst, nobody seems to remember him! Has he ever existed? In the second level dialogue you will encounter a QRcode. If you open it with an app, (there are many and they are all free, for example Foudre QRcode), you will find an Easter egg. Our scenarists are also presenting the Flow Machines logo – which, not coincidentally, is a parrot. Our story is sailing towards the end, when all the puzzle pieces will come together; so stay tuned! Finally, in this chapter, it seems that Max has found her own style. This style is embodied in a strange sculptural object which has something magical to it. During the dialogue among those four who seem to be the comic’s creators, some of the key aspects of Flow Machines are made explicit: notably, the searching for an original creation departing from a database, the AI capability to recognize styles and style as a computational object. And we also have two coups de theatre: Max’s father is dead, her mother is crying at his funeral, and Flowy… but… who the hell is Flowy? While Greg goes on with his tacky art, getting more and more popular and consensual, Max is still locked-up in one of the many rooms of the Castle. She is fighting and desperately working to find her own style, with the help of Flowy. But will you be able to tell the difference between Max’s art and what Flowy draws? At least in the case of music, it is quite difficult! Check out this article released by Quartz about one of the results of the Flow Machines project: AI can simulate Bach’s style. Can you tell the difference? In this chapter we see how Flowy acts as a database (of Picasso quotes) that intelligently, or at least so it seems, interacts with Max. As for Artificial Intelligence, the machine proposes paths to be followed but it is the artist who evaluates and interprets such suggestions. Also, on the walls of Thomas’ “castle”, you will recognize (if you are a computer scientist or a mathematician!) the graphic representation of Markov Chains, the technique at the very basis of the Flow Machines project and that allows to automatically generate our soundtrack. The nightmare scene is a citation of David B., author of several graphic novel masterpieces. The first song is "Mister Shadow", the dream song is "Où est passé l’ombre" while the end song is "Insensitive", a variation of Insensatez by Tom Jobim. All songs are by Benoît Carré and Flow Machines. Watch Fiammetta Ghedini coloring Flowy in the video below.